I’m becoming less resilient as I age. I think this is normal. But what my modus operandi has been for literally decades now is to travel at whim; go wherever pleases me, whenever the desire strikes. For years I could bounce back so easily. But lately, traveling takes its toll. I recently did a damn near cross country trip in three days: left on a Friday morning to start my travel at 6am to the destination, and started the return travel at 2am on Sunday. On that Friday, I arrived at the site at about 5:30pm; on that Sunday I arrived home about 5:30pm. I was only onsite for my intended travels for about 36 hours. Let’s leave out the expense associated with this, and the work that awaited me upon my return, and focus solely on the draining travel that occurred. Obviously no one made me do this; I made this poor decision on my own. But I’ve lived a life of poor decisions. It’s just now that they’re finally catching up to me. Well, the travel ones, anyways. The other poor life decisions having been chomping at my heels – if not consuming me whole – for years. I believe I’ve mentioned that I’m simply over traveling in these here electronic pages once or twice, and it’s true: it’s just that there are things I want to do that aren’t near me; people I want to see, too. And while I’m an old curmudgeon at heart, something inside me still drives me to see these people and places, chase fun, etc., etc. But I might be reaching that point where the return on investment (of time) is no longer worth it. I’ve always marveled at how people’s past interests and friendships fade by the wayside. It still especially boggles my mind if these people/things are proximate to where you live, but I’m coming to appreciating cutting the baggage that is thousands of miles away. That isn’t to say that the friendship or the activity isn’t still potentially of value, only that the travel to get there simply isn’t. I can only imagine how much worse spouses and kids make those situations. No wonder we die inside so quickly: the external world puts too much pressure on us. Think of all the things you used to do but no longer do. Now think of all the things you cannot imagine never doing again: soon enough they will lose their place in your life, much like you flush the dead goldfish down the toilet, throw out your high school yearbook, or stop reading someone’s inane garble on social media and block them – such a terrible thing to do to your mom! We’re all getting too old for something, every single day of our lives. I’m too old for sitting in front of the TV and watching football. I’m too old for cell phones. I’m too old for meat. 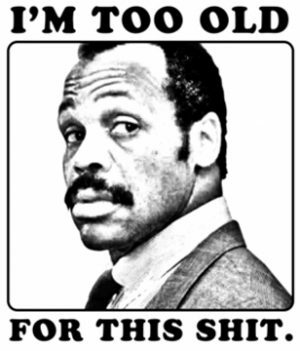 I’m too old for other people’s BS. I imagine you’re too old for me – and that’s okay: I like ‘em young, anyhow!